Nail changes on hands may indicate a large number of diseases. Nails examination can be an important complement to other diagnostic methods because it provides initial guidelines for early detection of certain diseases. This method was formulated by a famous therapist Ernst Issberner-Haldane (1886-1968), who discovered that organic diseases can change the shape, color and size of nails. Nails on hands are something like small screens of our body, which signal a disturbance early enough that they can warn us, but also to solve problems before they become a bigger problem. The shape of the nail on the upper part: whether short or long, wide or narrow, round, rectangular or oval. Front profile of a fingernail: does it have a normal arch, is there a half-moon, sharp edges or is it tubular. 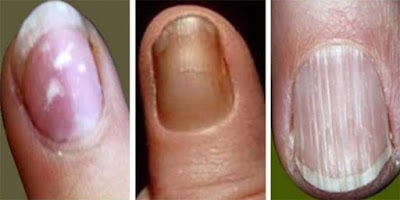 Nail changes: any visible stains, recesses, projections, transverse or longitudinal scars or any abnormal appearances. Color of nails: if the nail is pink, red, white, bluish, black, or if there are yellow stains on nails. Quality of nail: is the nail thick or thin, soft or flexible, soft or hard, brittle or elastic. These five criteria should be combined, and from their combination diagnosis can be made. For example too short fingernails may indicate a hereditary disorders of heart function and jagged nails are a sign of excessive nervousness. Second, nail biting can cause stomach problems, because nails contain substances that are harmful for the gastric environment. Changes on nails that are too rounded, and fingers have a drum sticks shape may indicate pulmonary diseases. White spots on nails are a sign of excessive deposition of urea in the body, but also nervousness. Pale nails are a clear signal for iron deficiency in the body. Slightly blue colored nails are a sign of oxygen and carbonic acid accumulation, often occurring in heart failure and lung diseases. Problems with the nails that have longitudinal grooves, are often associated with lazy intestines and poor digestion. This phenomenon in smokers appears only on thumb. Wavy transverse grooves are the result of increased excretion of waste maters. They may indicate the anemia condition or vitamin b12 deficiency. If someone has a particularly hard nails, they usually have a solid bone structure and to soft nails are usually in conjunction with a soft bone structure. Brittle nails often occur as a result of applying nail polish, but it is not the only reason because this phenomenon occurs due to the hardening of blood vessels. Absence of white crescent shape is one of such changes on the nails that are associated primarily with the general weakness of nerves as well as the weakness of heart. Dark red nails occur in people with dense blood –people who are prone to strong oscillations of mood. Nail changes on hands - What to do? If your nails are breaking it indicates a lack of hydrochloric acid, the disorder is perhaps more serious and doctors should check whether assistance can be in the form of drinking one glass of warm water with the juice of half a lemon every morning. If you have dry and brittle nails this condition indicates a lack of vitamin A, then increase the intake of carrots, cabbage, pumpkins, peaches and melons and follow all the new changes in the nails, after applying the therapy. Messy and painful cuticles on hands suggest that you lack essential fatty acids. Increase the input of almond and castor oil as well wheat oil and lubricate your nails with pure vitamin E. Brittle and distorted nails warn of nail fungus, then it is necessary to reduce the input of carbohydrates. In this case eat more garlic and apply tea tree oil, wild oregano oil or simply rub with a mixture of garlic and honey the affected nails. Absence of crescent nail shape indicates a lack of protein and disorder of metabolism, such changes in the fingernails should be reason enough to pay a visit to your doctor. Yellow nails can be the result of excessive nail polish usage, smoking or even some disturbances of liver function. Then lubricate nails with vitamin E and castor oil mixed with lemon juice, if you suspect problems with liver, make sure to find other causes of nail changes and solve the problem. Fingernails with a notable longitudinal grooves can mean that your body is poisoned with heavy metals, and that liver does not have capacity to fight against it and necessary is a serious detoxification of the body and above all liver cleansing. Nails with transverse grooves indicate the first signs of memory loss and attention should be drawn to the microcirculation, increase physical activity, pay attention to nutrition and make sure that you make your brain work with slight mental exercises. For nail biting in children, on the other hand, seek specialist help, to eliminate the psychological causes of the disorder. How healthy fingernails look like? Normal and healthy nails are smooth and have no circles or grooves or furrows. The nail should be easily rounded, and its surface should be pink, pearly and have natural shine. Every nail should be completely elastic, and their roots should have white semicircle. Nail skin, should surround it and protect it and by no means should you remove it for cosmetic reasons, although many do and they are making a big mistake. All nail changes on hands should be seen and analyzed in detail. You can do this alone at your home. If you go to the therapist, always keep in mind that diagnosis of nails is not the only basis for further treatment, but gives more than useful guidelines and facilitate the work for making a real diagnosis. Nail appearance is an integral part of today's medical examinations and diagnosis process. This is done by doctors who deal with natural treatments or therapists. The facts are that nail changes may indicate diseases of internal organs, and may indicate further problems. In addition to revealing the state of health, our fingernails especially if they are lubricated or polished can hide many things. So under polished nails you cannot see all that dirt, which would have been visible with the naked eye. When it comes to artificial nails, the situation is even worse. Bellow seemingly neat nails, a whole realm of bacteria hides, which are collected and neatly deposited in the invisible space below the nails. The remains of food, various traces of dirt are a perfect base for the development of germs that can come into contact with the mouth or nose, easily penetrate into the body and cause serious problems. Thick layers of ornate plastic hide the dirt, and we do not even think about brushing of nails with a brush and get rid of the problem, but we disguise it further. Although artificial nails have become popular and an inevitable part of femininity, think before you opt for this choice. There are other reasons why you should keep your natural nails. Some people who are engaged in a little deeper and broader issues of health believe that our hair, skin and nails need to stay in the same kind of condition that nature gave us because changes on nails, hair and skin signal much more serious problems. Also, nail polish prevents sunlight to penetrate to the nail, and sunlight for nails as well as for other parts of the human body is necessary for normal functioning. Therefore the most ordinary fingernail files will make your nails look neat and nice and you will get a great nail shine. So to see all the changes on your nails and prevent the occurrence of diseases, skip nail polishing. One of the most dangerous things you can do to your child is to allow nail polishing. At the very end we left out a peculiar thing and that is if you do your nails on Monday (regardless of whether you just cut them, file or polish them) it will lead to prosperity and even to material gain. This is of course an old wives tale that was never confirmed, but it is not unknown that many women do their nails on Monday. In any case, make sure your fingernails are neat, and therefore you will be healthier and in better mood.